Russell Westbrook doesn't hold back -- even on Reddit. To say Oklahoma City Thunder superstar Russell Westbrook isn’t the friendliest person to the media would be an understatement. 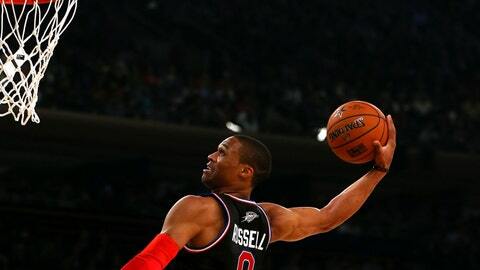 Westbrook drew comparisons to Seattle Seahawks running back Marshawn Lynch last season with his surly attitude toward reporters and curt responses. But perhaps Westbrook’s apathy is toward answering questions. In a Reddit AMA on Wednesday, Westbrook was asked who he would posterize if he could dunk on anyone in the world. If you read the full AMA, it’s clear Westbrook doesn’t care about half the questions being asked, if not more. His answers are pithy and indifferent, and most ignore the context of the question. He doesn’t care what we think of him, and he’s got the talent, athleticism and skill to back up that raging attitude. Don’t hate on the brodie. And for that fan’s sake, hope you never meet Westbrook in person. Read the rest of the AMA and learn a little — seriously, you won’t learn much — more about Westbrook here.